Fall is an awesome time of the year! So we thought, why not make a game out of it that will prep them to go help their parents rake their lawn at home! Fake Leaves. You can buy them HERE, or if you’re feeling super ambitious, you can use real leaves. Rakes. We used 2 for each team. We just asked our leaders if they had any and we grabbed some of our own. Leaf Blower. Same thing here we didn’t buy these we just borrowed electric leaf blowers from people in our church. Leafs go in the middle of the floor in a pile. 2 racks and 1 leaf blower on each side of the pile. Tape out a line where your students have to bring the leafs over to, and count for their team. The winner might not be obvious in this game, and is based mostly on your opinion of which team has gathered the most leafs at the end of each round. Pick two teams of three. One player will have the leaf blower and the other two will have rakes. Set up is super important. You will want to separate the players so that both people raking are on one side with the leaf blower from the opposite team. 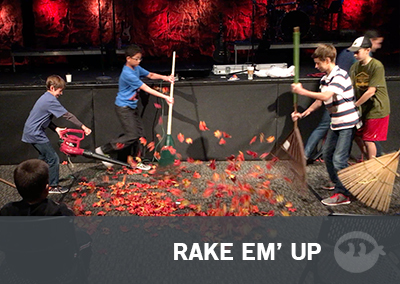 Two rakers from Team 1 and the Leaf Blower from Team 2 will be on one side, and the Two rakers from Team 2 and the Leaf Blower from Team 1 will be on the other side. The object is to have the most leaves on your side at the end of a 60 second round. 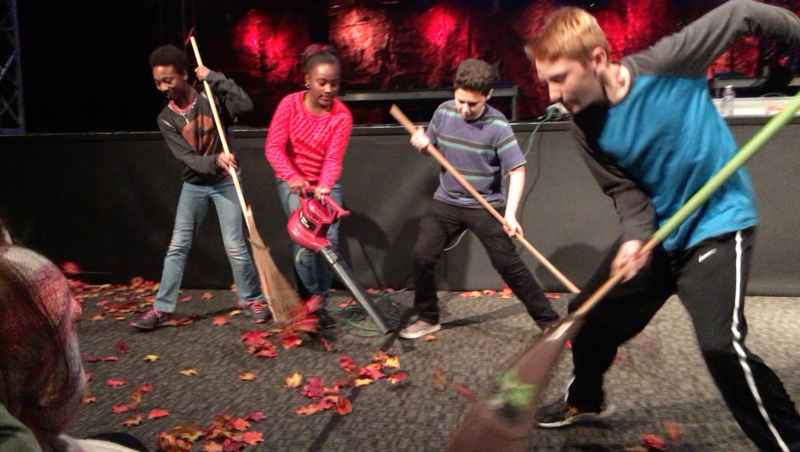 The leaf blower trys to blow leafs toward their side and the rakers try and rake leaves on their side. 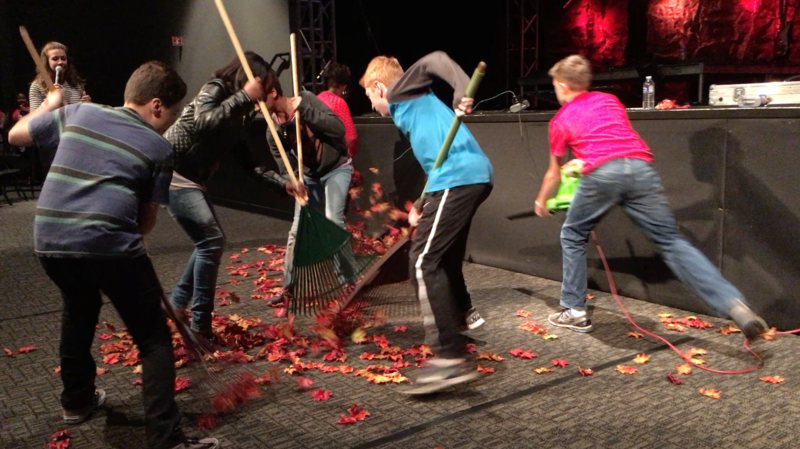 At the end of 60 seconds the team with the most leaves is the winner.